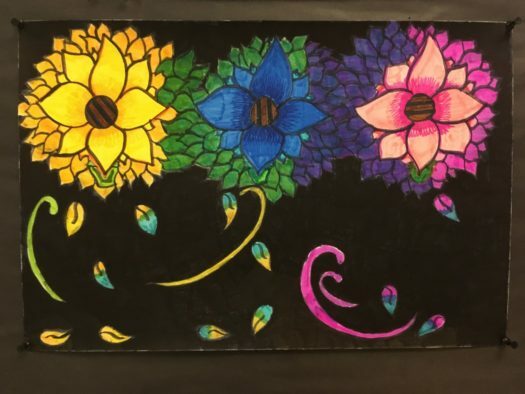 November’s artist of the month is freshman Cheyanne Quintanilla. Despite being a fresh face at OTHS, Quintanilla has already left her mark, whether it be through art, her position on the homecoming court or with her friends. Art I with teacher Paula Carroll is a safe haven for Quintanilla, as art serves as her escape. “It’s a place I can express myself and my creativity, to give life to my thoughts,” Quintanilla said. She loves working with markers and paints because they give off vibrant colors. Quintanilla is doing a great job in class, using the structured time to let her creativity shine. “I’m excited to see what she’ll create for the rest of our projects,” Carroll said. In the future, Quintanilla would like to have a career involving art or photography.